The Library’s conservation internship programme started in 2005 and is generously funded by the Library’s Contributing Members. Since 2006 the programme has been co-funded by the Heritage Council. The twelve-month internships are designed to give recently graduated conservation students the opportunity to develop their practical skills while continuing their technical training. It provides time to explore new ideas and carry out research as well as first-hand experience of working within a busy museum environment, which is essential to career development. The internships are typically advertised in May/June with closing deadlines in July/August, to find out more check the Vacancies page of the Library’s website. Dorothea Müller (2017) graduated from the Academy of Art and Design in Stuttgart with an MA in the conservation of fine art, specialising in books and works of art on paper, in 2015. Her interest in conservation began when she trained as a bookbinder at the University and State Library in Darmstadt. Before joining the Chester Beatty, Dorothea worked as a book conservator at the Bavarian State Library in Munich. During her internship at Chester Beatty, Dorothea had the chance to work on Asian and Islamic materials, which has expanded her portfolio of work and given her new and exciting research opportunities. Since leaving the Chester Beatty, Dorothea has been working at the Bibliotheca Augusta in Wolfenbüttel, Germany. Cécilia Duminuco (2015-2016) completed a two-year MA course on the Conservation of Books and Library Materials at West Dean College in the U.K. Prior to this, she obtained an MA in painting conservation at the École Supérieure des Arts Saint-Luc of Liège in Belgium, where she trained for five years. During the past few years, Cécilia has undertaken several short work placements in various notable institutions, including the Royal Institute for Cultural Heritage – KIK-IRPA, Brussels, Belgium and the Oxford Conservation Consortium in the U.K.
Cécilia is especially interested in painted surfaces, illuminated manuscripts, and bookbinding structures, and has been researching continuously to increase her knowledge on the subject. Since the end of her internship, Cécilia has been working at the Cambridge University Library and she is currently employed as book and paper conservator at the University of Manchester. Puneeta Sharma (2014- 2015) graduated from Camberwell College of Arts, University of the Arts, London, in June 2014 with an MA in Conservation (Art on Paper) and previously studied BA Fine Art at Central Saint Martins. Before embarking upon a career in conservation, Puneeta worked as an artist and an Arts-in-Health assistant for the arts psychotherapies’ services in various NHS Trusts. Before starting her internship at the Chester Beatty Library, Puneeta worked at Magdalene College, University of Cambridge as their first Paper Conservation Intern, and the National Archives in London as a Project Conservator. Puneeta’s recent interests have developed to include pastel paintings from the 18th century with a focus on the impact of transport and display on the fragility of the media. Puneeta has been working at the Royal Collection Trust in Windsor, U.K. since November 2015, where she is now Assistant Drawings Conservator (Prints and Drawings). Josefin Bergmark-Jimenez (2013-2014) trained as a bookbinder before studying conservation at West Dean College in the UK, where she graduated with an MA in Book Conservation in 2011. When she applied for the CBL internship she was working as a digitisation conservator at The National Archives, London. During the internship Josefin had the opportunity to work with a wide variety of objects from the amazing collection but with a focus on books from the Arabic collection. Josefin also learnt more about pigments and pigment consolidation. In addition to this, Josefin prepared objects for the exhibition Chester Beatty’s A to Z and several other temporary exhibitions. Following her internship Josefin has worked for The National Library of Sweden and Trinity College Library as well as for the Antarctic Heritage Trust, New Zealand, working with paper and paper objects from The British Antarctic Expedition 1898-1900 (The Southern Cross Expedition). The objects were retrieved from the first Antarctic hut at Cape Adare and once treated will be returned to Antarctica. She has since returned to Sweden and is currently working part-time and considering setting up her own conservation practice. Elisabeth Randell (2013- 2014) graduated with an Advanced Diploma in Museum Studies, Algonquin College, Ottowa. In 2013 she moved to Dublin for an internship in at The National Gallery of Ireland. Following a short contract assisting with a digitisation project she was offered a nine month internship at the Chester Beatty. Elisabeth’s internship entailed working on a wide variety of objects, ranging from mother of pearl Japanese fans, Persian Miniatures, and Indian drawings. Under the supervision of the Head of Conservation she was responsible for various procedures for their treatment such as condition assessing, documenting, treatment reporting; surface cleaning, aqueous washing, humidification, pigment consolidation, tear repairs, mounting, and assisting with art handling for photography. Additionally she aided in surveying parts of the collection, including the Japanese shrines, Sumatran manuscripts, Jain texts, Japanese & Chinese scrolls, and Islamic Qur’an scrolls. 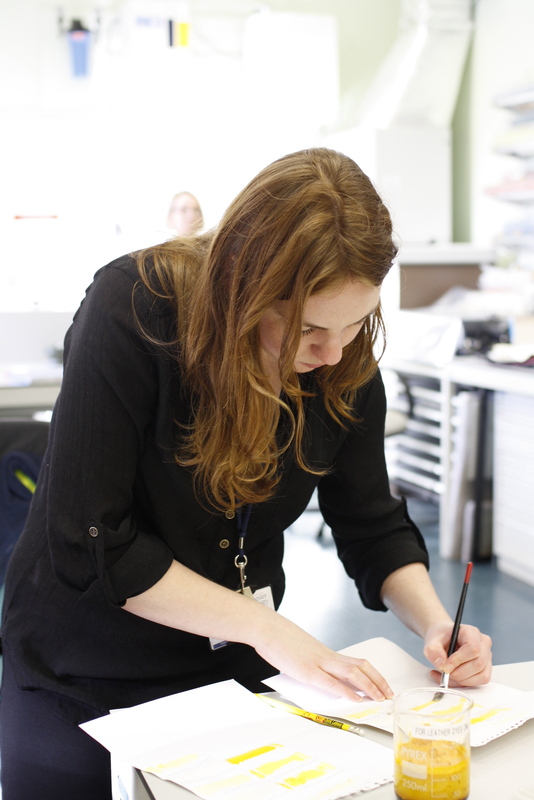 Shortly after finishing her internship Elisabeth was offered a contract as preventative conservator at the National Gallery of Ireland, before beginning an MA in conservation of Art on Paper at Camberwell College of Arts, London. After several internships and contracts at the Royal Collection, the V&A Museum, and Trinity College Dublin, she is now working as a conservator the British Library. Julia Poirier (2012-2013) graduated from a two-year Masters in paper conservation at Northumbria University, Newcastle in 2010. She went on to work in private practice and the Special Collection at the University of Edinburgh before joining the Derry and Raphoe Conservation Project with the University of Ulster before joining the Chester Beatty in 2012. Julia’s internship involved the conservation and preparation of Indian miniatures and bound items for two major international loans to the USA. She was involved in the preparation for digitisation of the Early Biblical Papyri collection as well as working on specific items from all three collections for permanent and temporary gallery rotations. Following the completion of her internship, Julia was offered a contract as a Book and Paper Conservator at the Library. Fiona McLees (2011- 2012) graduated from the Masters Conservation programme at Camberwell College of Arts in 2010. She then undertook a personal research project cataloguing a collection of historic paper samples at the British Museum, and a short contract at the National Archives in Kew prior to beginning the internship at the Chester Beatty. During her internship, Fiona worked with a wide variety of objects. A large proportion of her time was spent collaborating with book conservator Rachel Sawicki on the conservation of a 16th Century Persian Qur’an by Ruzbihan, contributing to research into the techniques and materials used in the production of this masterpiece. Fiona went on to work as a contract paper conservator at the Imperial War Museum, London, focusing upon preparing a large and varied collection of WWI items for the new permanent galleries. Following this, she completed one year as paper conservator for acquisitions at Tate, working primarily with modern and contemporary photography and art on paper. She is now based at the Bodleian Libraries, Oxford, working once again within a historic library collection. Rachel Sawicki (2009 – 2011) worked as an Assistant Conservation Technician at the Bodleian Library, UK for three years before she undertook the Conservation Master’s degree at West Dean College, specialising in the conservation of books and library materials. 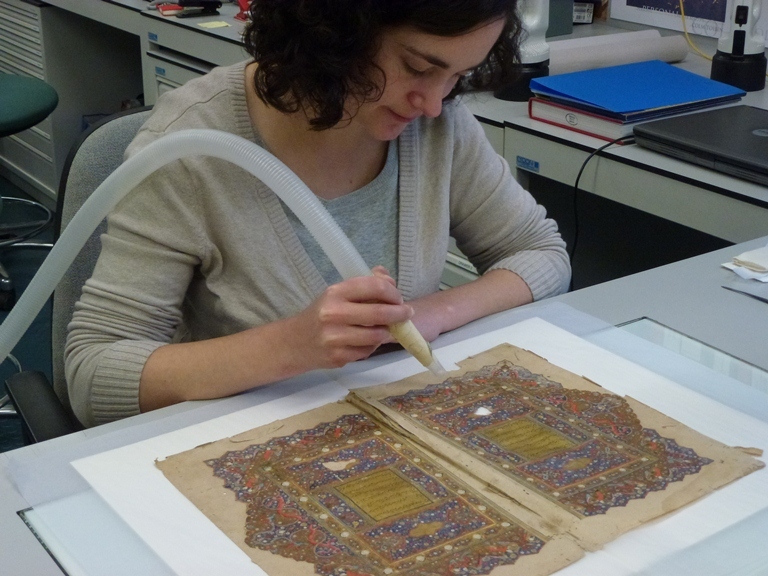 Rachel’s internship initially focused on the conservation of the Library’s bound Shahnama manuscript collection under the supervision of the Senior Book Conservator Kristine Rose-Beers. She also helped to install and de-install five major exhibitions in the Library’s permanent and temporary galleries. Following the completion of her Heritage Council internship, Rachel was offered a one-year contract at CBL as Book Conservator focusing on the conservation of Islamic manuscripts. For the past two years Rachel has been honing her conservation skills at the National Library of Australia lab. She is currently working as Exhibitions Conservator at NLA, where she continues with her love of conserving historic books. 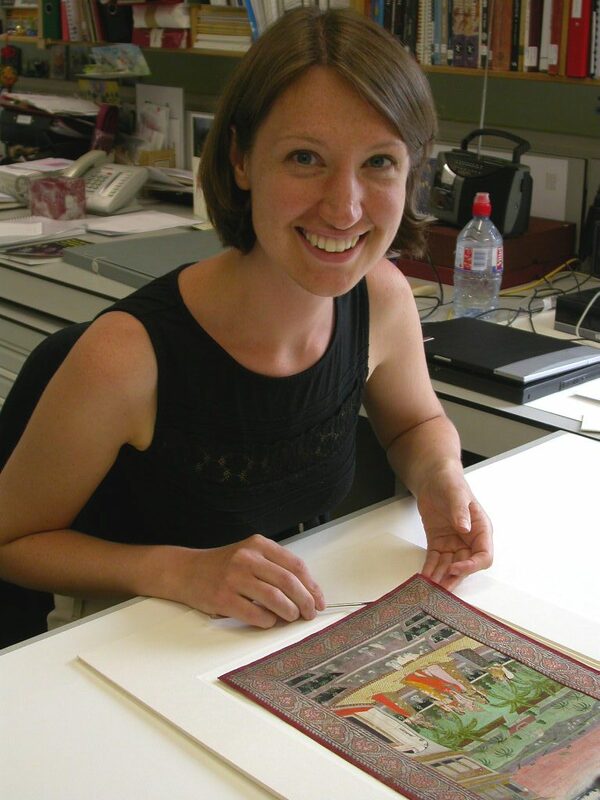 Rachael Smith (2006- 2009) had completed an MA in paper conservation at Northumbria University, and a one year internship in a commercial studio before she joined the Chester Beatty. The main focus of Rachael’s internship was preparing a collection of Mughal Miniature paintings for a major travelling exhibition, Muraqqa. This involved creating condition reports and researching treatment options before stabilising the paintings for travel. 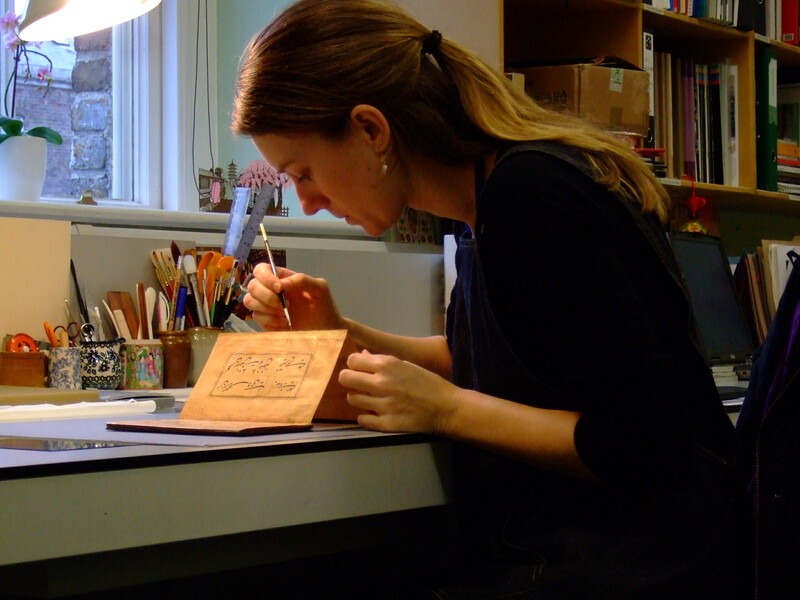 On completion of her internship, Rachael worked at the Chester Beatty Library as a Paper Conservator for six months. She then became a Project Conservator for the Marianne North Gallery at the Royal Botanic Gardens, Kew in London for 18 months. 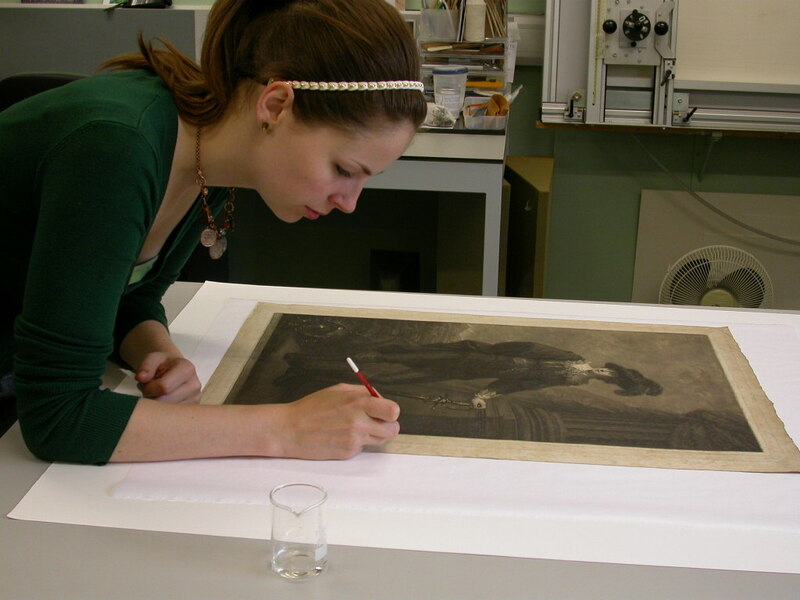 Rachael now has a permanent job as Drawings Conservator for the (UK) Royal Collection, at Windsor Castle. Louise O’Connor (2005-2006) had just graduated from Northumbria University’s Masters programme in the Conservation of Fine Art- works of art on paper when she became the Chester Beatty’s first intern. Louise’s internship focused on the conservation of items in the Armenian collection in preparation for the publication ‘The Armenians: Art, Culture and Religion’. She also helped to install and de-install exhibitions such as ‘Albrecht Durer’ and ‘Chinese Printmaking Today’ in the Library’s galleries. In 2006 Louise moved to the post of assistant paper conservator at the National Gallery of Ireland for a year and then on to the National Library of Ireland where she is now conservator responsible for prints & drawings, ephemera and heraldic manuscripts collections. i wish i had an opportunity to work on conservation projects in porcelain, paper, and metal. Having qualified on a novice course from the SA Institute of Objects Conservation and worked for last 9 months on a variety of projects. This gives me the passion to be part of such an institute. My background is a self taught fine artiste, trained several students for high school british art exams. I have a Masters in Business and have decided to change my career into conservation.